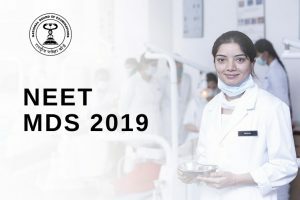 NEET-MDS 2019 is a single window entrance examination for all Dental PG courses -2019 Admission Session. No other entrance examination, either at state or institution level, shall be valid for entry to MDS Courses. NBE shall be conducting NEET-MDS as a Computer Based Test (CBT) on ……….. in a single session at all the test centres. A candidate for admission to the Master in Dental Surgery course, must possess a recognised degree of Bachelor in Dental Surgery awarded by a university or institute in India and registered with the State Dental Council and has obtained provisional or permanent registration and has undergone compulsory rotatory internship of one year in an approved/recognised dental college. The cutoff date for completion of internship towards the determination of eligibility for appearing in NEET-MDS 2019 shall be announced soon. Candidates can register for NEET-MDS through the online portal from. Candidates can choose the exam city through an online registration system on first come first serve basis. The fee for the examination has to be remitted through the payment gateway, at the time of online submission of application form, using a credit card or debit card issued by Banks in India or through internet banking. Applicant candidates are required to read the NEET-MDS 2019 Information Bulletin thoroughly. The Information Bulletin will be available at www.nbe.edu.in. Candidates are informed that any indulgence in unfair means shall be viewed very seriously and the candidature of such candidate shall be cancelled atthe bare threshold. Use of Mobile Phones/Electronic Devices is strictly prohibited in the premises of NBE Examination Centres. Candidates shall be liable for penal action for Possession/Use of Mobile Phones/Electronic Devices. Kindly read the information bulletin carefully.